Delta Marine Service was originally founded in 1977 by Ken Harlos, in North Saanich B.C. Canada. Initially, Ken was living in Delta B.C. in the Greater Vancouver area, working for White Motor Corporation. He enjoyed his job there as a mechanic, working on heavy-duty trucks and buses. At that time, he was also doing marine servicing out of Cedar Grove Marina. Clientele grew as did the demand for marine service. In 1985, Delta Marine was relocated to North Saanich on Vancouver Island. Once established, the company evolved quickly. In 1989, Ken Harlos had brought a handful of sub-contractors, including Brian Coverley, on board to help deal with his increasing volume of business. The two collaborated well together and created a successful business partnership. The company expanded significantly and prestige increased dramatically when it became an official Fleming and Grand Banks authorized repair and service center. By the end of 2012, Brian Coverley became sole owner. The bulk of the company’s work takes place on site but they also travel globally to do warranty, modification and maintenance work. Although Delta Marine specializes in Flemings, they have earned a solid reputation as a service center for vessels of all shapes and sizes. Our qualified technicians install fire safety equipment, smoke, propane and carbon monoxide detectors. Rest easy knowing your family is safe at sea. Delta Marine can sync your vessel’s systems to your tablet or cell phone. You can receive updates and alerts in real time, giving you peace of mind. Customer service is our top priority! 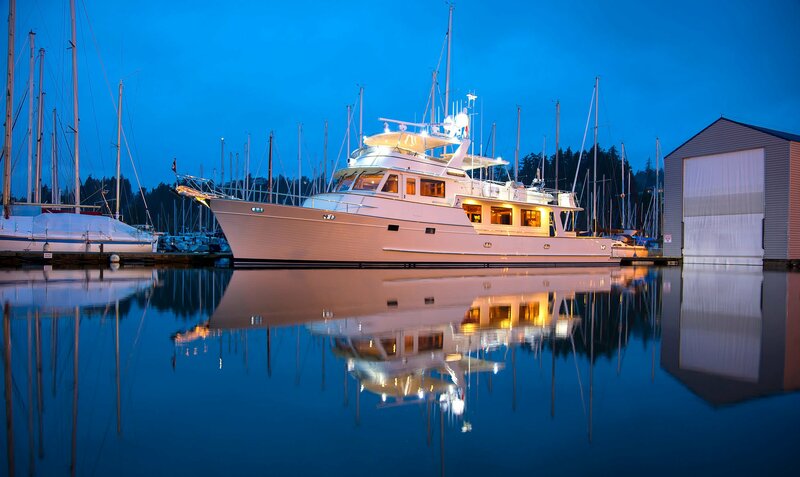 We are completely mobile, offering on-site service and repairs at your vessel’s port of call or moorage. “Being a Fleming Yacht service centre is our number one priority, as it has been for the past 10 years. Fleming yachts are exceptional vessels. They’re built in Taiwan and sold around the world,” [Coverley] said. SIDNEY – Over the past three decades, Delta Marine Service has grown from a single service technician in a van into a global service centre for one of the premiere yacht manufacturers in the world. “Delta Marine was started about 30 years ago by Ken Harlos over in Delta on the Mainland, hence the company name,” explained current owner Brian Coverley. Once established, the company grew quickly. By 1989, Harlos had brought a handful of subcontractors, including Coverley, on board to help deal with his increasing volume of business. Having outgrown his mobile service van he began working out of a pair of boat sheds at the North Saanich Marina where the fledgling business did repair work, boat refits, detailing, mechanical and electrical work and other services. By 2000 the company’s present building at the Westport Marina in Sidney came up for lease helping to set up the structure Delta Marine Service uses today. Today, Delta Marine, with a staff of 31, is one of the most experienced and best equipped boat service centres found anywhere. Located at 2075 Tryon Road at the Westport Marina the company features a 100’ x 40’ maintenance shop and a pair (70’ and 65’) of floating boat sheds where work can be carried out on the water. 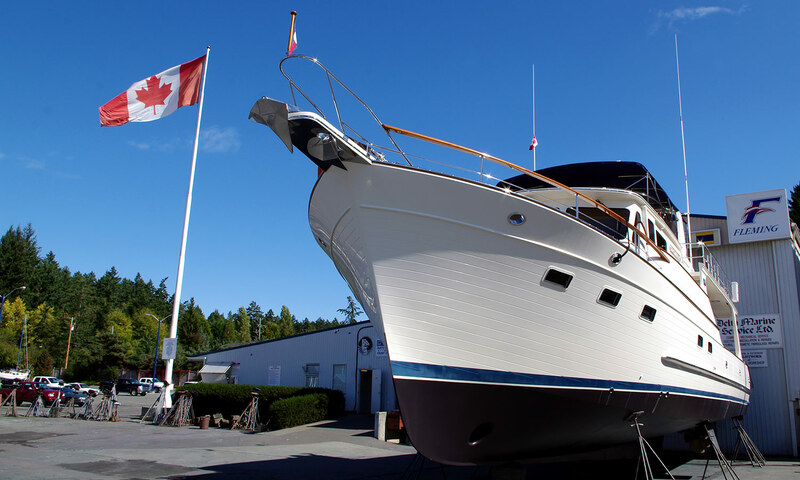 The company’s workload and prestige increased dramatically when it became an official Fleming Yachts and Grand Banks Yachts authorized repair and service centre. “Being a Fleming Yacht service centre is our number one priority, as it has been for the past 10 years. Fleming yachts are exceptional vessels. They’re built in Taiwan and sold around the world,” he said. Not all of the work carried out by Delta Marine is as exotic as working on high end yachts in distant ports. The bulk of the company’s work takes place at its work yard in Sidney. “We do all of our service work right here on site. We can haul out a vessel up to 65’ in length here in Sidney, while anything over 65’ requires us to take it to Campbell River where we can pull them out at Ocean Pacific to do the repair work. We’ll travel up there to do the work,” he explained. A full service marine service centre the company recently purchased Mainstay Rigging, a well respected sailboat maintenance company. “We have a stainless steel and aluminum fabrication shop which goes with that to look after the repair and maintenance needs of the sailing community. So we pretty much cover everything, we have welders sailboat riggers, electricians, carpenters, mechanics, and others,” Coverley said. Delta Marine has consciously positioned itself to address the maintenance needs of the entire boating community.” We look after everyone from the guy with a 10’ outboard to the 120’ yacht,” he said. “Our future success is linked to us not standing still, we intend to keep expanding where we can and always keep strive to keep moving forward. During the summer we’ll pretty much run seven days a week, so if you don’t like working weekends this is the wrong industry for you.” To learn more, visit the company’s Facebook page and its company website at: www.delta-marine.com.